I also love Free-For-All because it’s one of those albums that teleports me to a specific time and place. It anchors me in the summer of 1992, the year I met my future wife. That was also the summer of REM’s Automatic For the People and I had that album and this one on opposite sides of a cassette tape that I played non-stop in my car for months. I can’t hear these songs without feeling like I’m in my maroon Toyota Corolla (as opposed to the black Toyota Corolla I own now) driving to my college classes, my movie theater job or to Denny’s for a late-night snack with Alex at my side. There might be room for a future theme week all about those teleportation albums and songs. I can think of several off the top of my head, and the memories are all good ones. I’m curious to hear about the music that has that effect on my dear readers as well. And who decided you’d rescue me? It comes down to this? 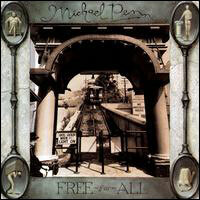 This entry was posted in song of the day and tagged Free-For-All, Michael Penn, Strange Season. Imagine if your teleportation songs took you back to awful memories. How horrible would that be. I’m guessing we’re quicker to keep the music on that elicits the positive memory. Otherwise… yikes. As for me, I don’t know this album very well at all, likely because that was the summer I was consumed by morning, afternoon and night sickness and was not rushing out to buy the newest Michael Penn album 🙂 Good song, however. And I like how the title works so well as a symbol for this whole discussion – was that your intention? Anyway, hard to imagine an album topping March, but, if you say so, I must check it out. As for teleportation by music, I’m sure there are a number of songs that would bring me to a happy place of my past. One that brings me to a less than happy place is Nora Jones’ “Sunrise.” When my mom was ill and in the hospital in the last year of her life, we had brought in a CD player for her to hear music. One of the CDs was by Norah Jones and the song that always seemed to be on was “Sunrise.” It seems that, now-a-days, whenever I turn on The Coffee House satellite radio station (often when I am going outside to clean the pool, but sometimes in the car as well), “”Sunrise” is either playing or comes on in short order. It always jolts me emotionally and in memory to that bittersweet time of spending those last months with my mother. I am, of course, the last person to get all spiritual, but, when that song plays, I always have the fleeting thought that maybe she is using it to reach out to me…to remind me to remember her. As if I will ever forget, although the distractions of life and the passage of time do have a way of creating static interference. Exactly the same for me Dana…I think of it as an inadvertant Clockwork Orange effect and should such awful circumsatnces arise again I may have to go through it in stony silence. I remeber leaving Tampa for Guam in 1965 and leaving my best friend, Rachel Crane. The music on the radio kept playing the song “Sunny” and I kept weeping. The Beatles, “Hello/Goodbye” was on in 1967, Guam, while I mooned over Rawlin Potter, the cool long-haired boy from California. “White Rabbit” was sung again and again as I rocked a certain, cute baby brother to sleep. The soundtrack of life brings out the nostalgia. without thinking of Selma. Which actually makes me love the song all the more. This is some powerful stuff on my little old blog. Thanks for sharing, everybody.